Need more information about booking Home 9238028 ? 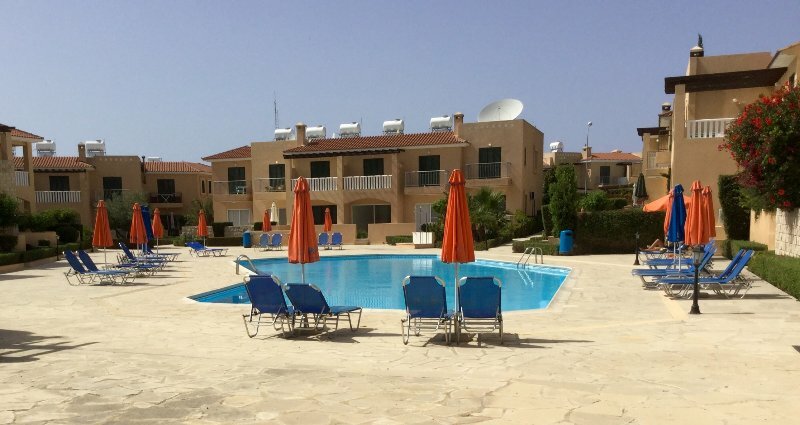 Newly refurbished, two bedroom, ground floor apartment on popular development in Polis, Cyprus. Situated in the sought after community of Polis Gardens, walking distance to the restaurants and bars of Polis, this two bedroom apartment has been given a complete overhaul, with new furniture in June 2016, as well as a new oven for those who prefer to cook at home. The development boasts a large pool area and attractive landscaping, with a new play area installed in the summer of 2016. The apartment is located at the rear of the properties, looking out onto trees and fields, but less than a minute’s walk to the pool. It is ideal for those that want the convenience of the pool without necessarily the noise that can come with it if busy. The apartment itself is accessed either through a secure lobby area or by lift or stairs from the private underground parking. Inside is a large open plan lounge/diner with kitchen at one end. At the opposite end patio doors lead to a large covered terrace. The lounge/diner was completely refitted with solid oak furniture, new sofas and a new tv with wifi and internet television recently. The kitchen has a new oven and comes with microwave, dishwasher and washing machine for your convenience. The bedrooms are located to the side of the lounge/diner area with a family bathroom between them. The master bedroom has a double bed and bedside units with fitted wardrobes, an en-suite shower room and patio doors leading to the terrace, as well as a small window to the side of the property. The second bedroom has two single beds with a bedside table between them and fitted wardrobes. The covered terrace is fitted with table and chairs, as well as two chair/loungers for enjoying the sun. There is also a storage box with beach mats, parasol, children’s sand toys and pool ‘noodles’ available for use, we only ask that you return them to their original location on departure. Polis itself is located 35km from Paphos and 45km from Paphos airport, providing quick and easy transfers. Car hire at Paphos airport is very straightforward and driving time is less than an hour. A private taxi can be pre-booked for approximately 50 Euros each way for a family of four and there is an hourly bus service that runs between Paphos and Polis every day. Polis is a small traditional town with all the usual amenities, as well as a variety of restaurants and bars. The town has its own blue flag beach approximately 25 minutes walk or five minutes by car from the property and just 3km away is Latchi (or Latsi) village, with its popular marina surrounded by restaurants and beaches, where you will find boat trips, numerous watersports and quad bike rentals. A beach path joins Latch and Polis beaches for those who like to walk. Located on the edge of the Akamas National Park, Polis makes an ideal base for anyone interested in walking, cycling and hiking in the National Park, bikes can be hired in both Polis and Latchi. Further afield the Baths of Aphrodite are approximately 9km from Polis and Lara Beach, home of the protected turtle nesting site, is approximately 20km. For those wanting a busy nightlife or familiar fast food restaurants Paphos is the nearest location but if you prefer a quieter, more traditional visit Polis is an ideal location. There is a property manager available in the unlikely event that there are any problems with the property. Guests over 21 years of age, no stag or hen parties. This is a fairly quiet neighbourhood with a mix of residential and holiday rentals. For those wanting a busy nightlife or familiar fast food restaurants this rental is not suitable. You can get in touch with Trudie (the owner) through the contact form on this page. Send Trudie (the owner) an email through the contact form on this page. Alternatively, if there’s a phone number on this page, you can call them. How do I contact Trudie (the owner)? If you’ve already booked, go to Manage your holiday booking to view Trudie the owner's contact details or send them a message. Or send Trudie (the owner) an enquiry through the Contact the owner/manager form if you’d like a quote or more info first. When you pay online through the Book your stay form, a booking request is sent to Trudie (the owner). You’ll find out within 24 hours whether they’ve accepted - no money will leave your account before then. You can also request a quote from Trudie (the owner) through the contact form. The owner will email you the total cost for your dates and a link to book and pay online. Use the Book your stay form to pay provisionally online. You can pay by credit/debit card or PayPal. Trudie (the owner) will have 24 hours to accept the booking and no money will leave your account before then. Why can't I call Trudie (the owner) before booking? You’ll need to contact Trudie (the owner) to do this. Send them a message in Manage your holiday booking or through the contact form on this page. You can request to change the dates or number of people on your booking via the Manage your holiday booking page. To change your holiday dates use the Edit booking button. If you need to change the number of guests staying then send Trudie (the owner) a message. If Trudie (the owner) agrees, they’ll send you a revised quote outlining the changes. You can review and accept/decline this from the Manage your holiday booking page. You’ll have 48 hours to take action before the revised quote expires.